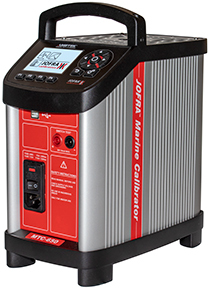 The MTC Series portable temperature calibrator is a fast, time-saving, cost effective calibrator designed specifically for the maritime industry. Maximize accuracy with a one year recommended calibration interval, or lower the cost of ownership of your temperature calibrator by extending the interval to three years! Reduce costs associated by recalibration and managing assets by 66%. The MTC temperature calibrator also features an intuitive easy-to-use interface, and popular functions like automatic switch test and auto stepping are available with special one-key-one-function buttons. Colored safety icons make it quick and easy to detect a hot or cold calibrator helping to reduce injuries, while a stability icon and time estimator help user’s track the current status.